Lisa Whitmer is the Director of Adult Education at The New York Botanical Garden. Since the earliest urban public parks and gardens were built, visitors have enjoyed these green spaces, and paused—to appreciate a bit of shade, admire a view, or watch an endless parade of fellow city-dwellers. But it is probable that very few have paused to consider how such places were created, and how all the design decisions made by landscape architects—about the shape of spaces, the slope of the land, the use of light, shade and water, the choice of plants and paving materials, and even the placement of benches—foster our sense of comfort and pleasure in these places. 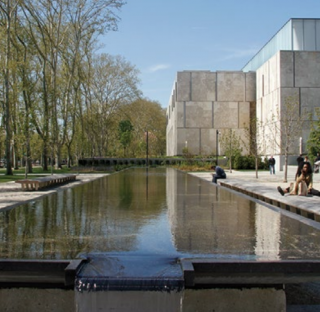 The goal of the Garden’s annual Landscape Design Portfolios Series is to share this knowledge of the design process through presentations of current work by outstanding landscape architects practicing around the world today. Each fall for the past 20 years, The New York Botanical Garden has provided a public forum for landscape architects and designers to discuss the projects that continue to enhance our lives. Portfolios Series speakers—including award-winning designers Cornelia Oberlander (Canada), Shunmyo Masuno (Japan), Barbara Aronson (Israel), Peter Wirtz (Belgium), Kim Wilkie (Great Britain), James Burnett (California), Laurie Olin (Philadelphia), and Signe Neilsen and James Corner (both of New York City), to name a few— have executed a wide range of projects, including tropical, temperate, and desert landscapes; public parks and private gardens; therapeutic spaces and vast harbors; spiritual shrines and rooftop terraces. Despite this variety, the basic format of the series has remained constant over two decades: accomplished landscape designers, using images of built projects, share the stories behind their work. The 20th Anniversary Landscape Design Portfolios Series, Time, Place, & Story: Design at a Crossroads, at Scandinavia House in Midtown Manhattan began with Charles Birnbaum, CEO and Founder of The Cultural Landscape Foundation, on October 1 and continued with Reed Hilderbrand’s Beka Sturges on October 15. It concludes with Thomas Woltz of Nelson Byrd Woltz Landscape Architects on November 5. All feature beautiful landscapes that heal the land, tell powerful stories, and celebrate history, culture, and ecology.